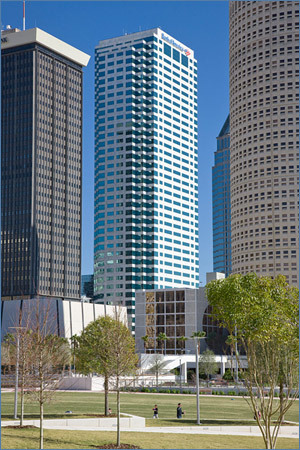 We are located on the 14th floor of the Bank of America Plaza in downtown Tampa. The Bank of America Plaza is located at the southwest corner of Kennedy Boulevard and Tampa Street. The 14 story parking garage is located on the adjoining block (just south on Tampa Street) and is connected by a Skybridge. From Tampa Street, take the first right after Jackson Street into the unmarked alley. The parking garage for our building is on the right and says Bank of America Parking on the entrance. Proceed to the gate on Level Three and take a ticket. Proceed to Level Six or above for an unreserved space. Once you park, take the parking garage elevator to the 3rd floor (Skybridge Level), come across the Skybridge and take the last elevator bank to the 14th floor. Morgenstern Phifer & Messina, P.A. is located in Suite 1480. Please bring your parking garage ticket with you for validation.